As a representative of my school community, it is my job as a journalist to report relevant and timely stories to our readers while upholding the integrity and reputation of the publication. This is why I am always trying to find ways to engage our readers through different outlets and create platforms that further define The ReMarker and Focus Magazine. Whether its helping to produce a 32-page newspaper, adapting multiple social media platforms or describing my passion for journalism in a presentation, I am always trying to deliver quality, branded content to our school community and beyond. Entering this year's newspaper cycle, I knew social media was going to be an essential engagement strategy. For Focus, our tri-annual magazine, I had the idea of extending the content from the magazine to the social media sphere, allowing our readers to engage with a wide array of information and marketing the content of our magazine. By providing extra content on our social media platforms, I hoped to do two things: expand the reach of our publications and establish outlets that make The ReMarker and Focus Magazine more multi-dimensional. And that's exactly what happened. Now, we are more in touch with our community than ever before while providing consistent content. 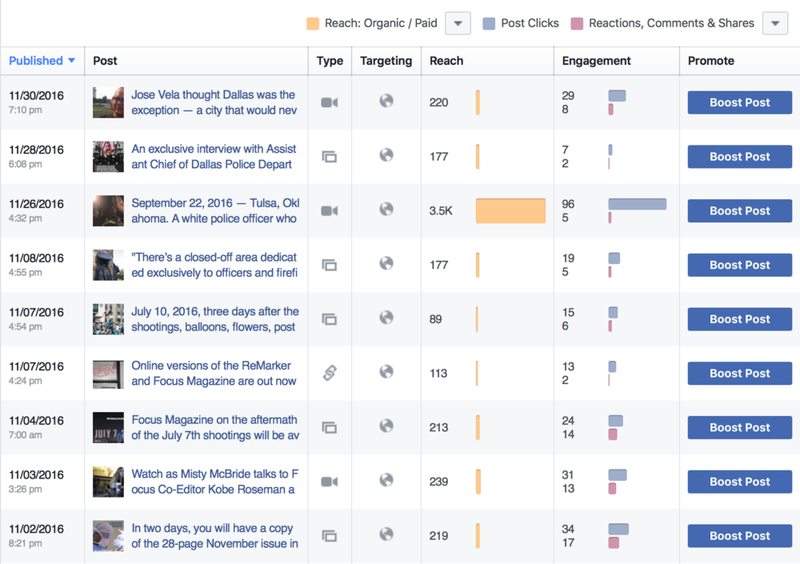 The pictures below quantify Focus Magazine's marketing through Facebook data. Click to enlarge. Furthermore, Focus has become an integral part of who The ReMarker is and how we provide our content. The detailed storytelling and specialized content of Focus make it a signature item of our publications. 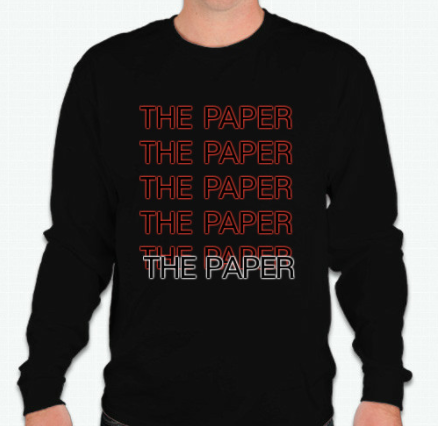 PAGE ONE DESIGN. During our redesign period over the summer, I knew that I wanted to drastically change the appearance of our cover page from previous years. We wanted it so that whenever someone picked up a copy of our newspaper, the reader would immediately know it's a copy of The ReMarker. So, we made sure to implement key design elements that distinguish us from other publications and establish our brand as a publication. The photos below are last year's page one (left) and news upfront (right). Now, the photos below are interactive images that point out the design elements of the newly-designed cover (left) and how the same elements are implemented on following pages like the news upfront (right). ATTIRE MARKETING. The Ice Bowl is an annual pick-up football game featuring the newspaper staff against the yearbook staff. Although the Ice Bowl is a friendly game between two publication staffs, I saw the game as an opportunity to advertise The ReMarker by designing the shirts we wear in the game. The shirts I helped design for Ice Bowl, which features a modern design and a unique tag line: The Paper. The back of the shirt not only includes spaces for a number and a nickname but also places the word ReMarker at the bottom of the shirt. The posters I designed for this year's Ice Bowl. At our school, seniors are required to present their passions to underclassmen in what's called a senior exhibition. For me, it was an easy choice. I decided to conduct my senior exhibition on my experiences with journalism to the eighth-grade class. I can still remember viewing a senior exhibition on The ReMarker as an eighth-grader and how it motivated me to join the staff the following year. In early October, I presented my passion to the eighth grade, introducing them to the ways of The ReMarker and showing them where the story can take you. Please hover over each image in my presentation to read more details on each slide. A transcript of the speech I gave to the eighth grade class before my Powerpoint presentation. The opening slide to my presentation, which includes a title. 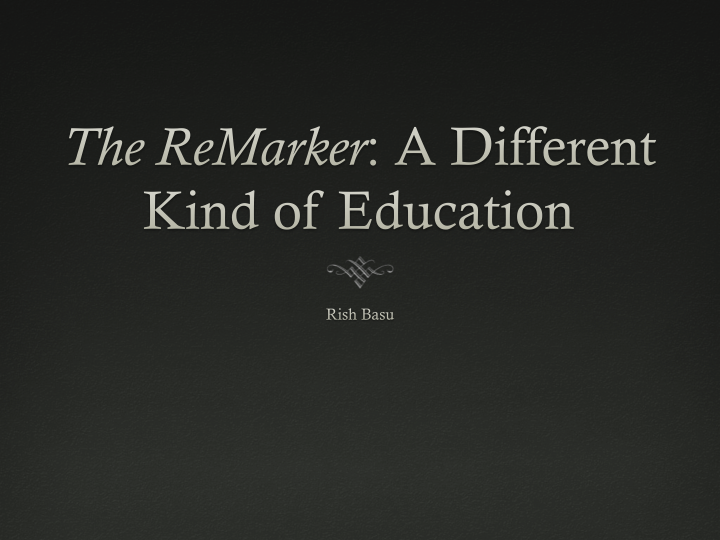 To start my presentation, I gave the eighth grade class a small overview of The ReMarker. In order to demonstrate how to work your way up on The ReMarker, I decided to outline my experience working for the publication. When I was planning my presentation, I tried to think of the best way to demonstrate what it's like to actually work for The ReMarker. So, I decided to use the rest of the presentation to walk the eighth grade through one of the cover stories on gun violence I worked on as a junior. The beginning of every cycle starts with a pitch day. In this slide, I talked about pitch day and what topics were brought up to make us decide to use gun violence as our cover story. In this slide, I talked about who I decided to interview for the gun violence story and the importance of the sources you decide to talk to. I give the eighth grade examples of some of the questions I asked to my sources. This slide demonstrates what kind of quotes we are looking for as journalists. I made sure to talk about the difference between certain quotes and when to use each one. As the writing part of my presentation ended, I ventured into design. Attached onto the slide is a picture I used for inspiration in the gun violence story. The next slide shows how I incorporated the elements of the picture into the tabloid design. This slide shows the results of my work. 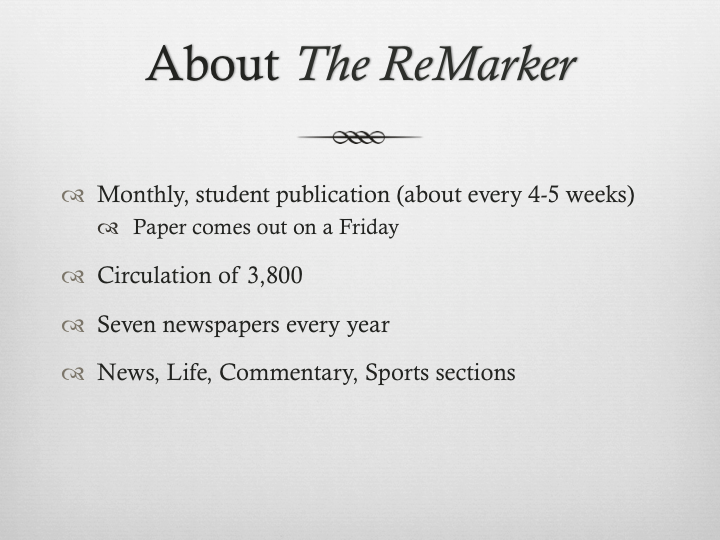 For one of my last slides, I talked about the role The ReMarker has played throughout my life and the benefits I have received from working for a publication. In this slide, I pointed out that I have received multiple awards, but I emphasized the underlying benefits such as creating relationships that last forever and giving yourself a lasting education. Finally, I left some time for the eighth grade to ask a few questions.